Set amidst the snow-capped peaks of the Saint-Gotthard Massif and the Mediterranean southern shores of Lake Lucerne is a place where tradition meets modernity. Uri, birthplace of the legendary folk hero William Tell, offers business-friendly policies and administration, bringing together prudent investors, innovative entrepreneurs and highly motivated employees for a successful future together. Discover why Uri is the perfect place to work, do business and live life to the full. We offer a safe pair of hands for your business concept and vision. Freedom and independence have always been important to us. And unlike many other regions of Switzerland, the Reuss Valley offers space for entrepreneurial development. Werkmatt Uri alone currently has 120,000 m² of free space, available for structuring to meet your needs. In addition, the sector-specific Schächenwald Industrial Park has a multifunctional infrastructure, offering ready-to-move-into lease space and high synergy potential for lessees and investors alike. Affordable land and real estate prices with excellent direct rail and road links speak for themselves. Take advantage of our dynamic setting combined with many years of technological expertise, and take part in the spirit of optimism driving Uri in the heart of Switzerland! Source: Based on figures from Wüest & Partner. As an entrepreneur, low taxes and duties offer considerable scope for action and investment, creating entirely new opportunities. 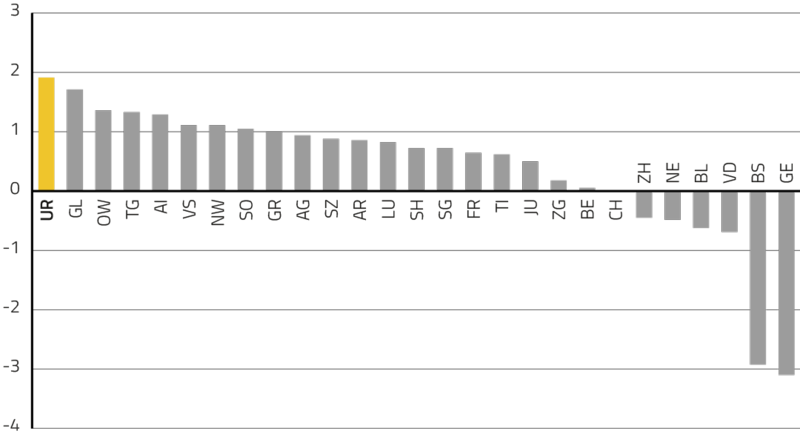 From a tax perspective, Uri outperforms many other cantons in Switzerland. For years, both natural and legal persons in Uri have benefited from flat rate taxes. Small and medium enterprises (SMEs) in particular benefit from the low business taxes with tax on earnings of 9.3 percent and capital tax of 0.01 tenths of a percent (cantonal and municipal taxes for Altdorf as the municipality of domicile). Uri comes out well in both Swiss and European comparisons. Uri also offers the best taxation of dividends within Switzerland; the 60 percent relief on dividend taxation all but eliminating double taxation. The bottom line, therefore, is that by basing your company in Altdorf, your business will have more money left over after the deduction of taxes than it would in other cantonal capitals. Source: Based on figures from the Federal Tax Administration (FTA). 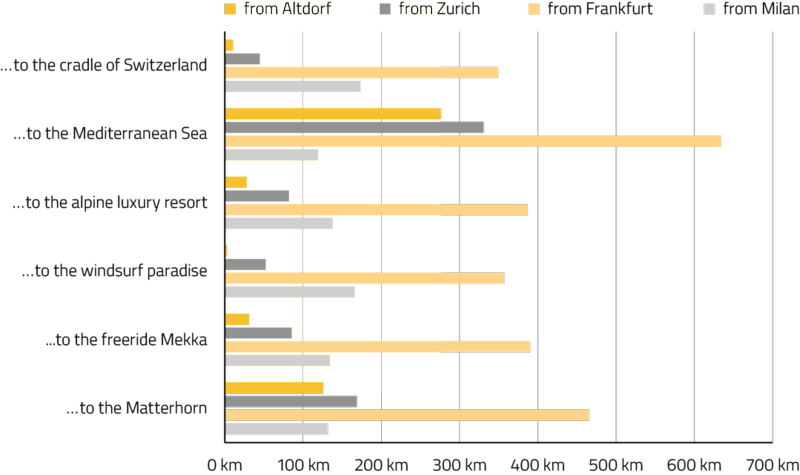 As a percentage of net profit with capital and reserves of CHF 2 million and a rate of return of 50 percent based on the example of cantonal capital Altdorf. Switzerland stands for security and stability, a high quality of life, beautiful landscapes, an excellent educational system – and general prosperity. However, our country is also known to be an enclave of high prices. Except that living in Switzerland of course does not cost you the same everywhere: Uri has been the canton with the highest financial attractiveness for residents for more than five years and it takes clearly first place in terms of freely disposable household income in Switzerland. According to a study published in December 2016, Uri combines several financial advantages in favour of the residential population: the tax burden, health insurance premiums and the costs of living are relatively low. At the same time, the possibilities for families to claim tax deductibles are substantially above the Swiss average. For example, Uri permits the highest deductions for costs incurred on the way to and from work and supports commuters this way. Childcare outside of the family is also supported by tax breaks in Uri because the effective costs can be deducted from the income tax. There is a top limit for this in all other cantons. Overall, therefore, the residents of Uri profit in several ways at once. In Uri, they get to keep around 70 percent of each Franc earned a year for their free disposal. No wonder people feel good in Uri. They enjoy the lively small-town setting in the municipalities of Urner Valley, the picturesque villages in the side valleys, the impressive natural environment of the Alps and a diverse recreational and cultural offer. Source: Based on figures from Credit Suisse Group Ltd. Excluding commuting costs; synthetic indicator, CH = 0. Uri is optimally positioned to meet your transportation and logistics requirements: the St. Gotthard Pass has always offered the most direct route between Southern and Northern Europe. Ever since the Gotthard Rail Tunnel opened back in 1882, there have been swift rail links through the Alps for goods and passengers. And a new major tunnel project was scheduled for completion in 2016: the Gotthard Base Tunnel, which connects Erstfeld in Uri with Bodio in Ticino through the world’s longest rail tunnel (57 km). The flat, low-level traffic tunnel will offer particularly safe transport and significantly reduce travel time thanks to top speeds of up to 250 kph. Uri also offers excellent road (motorway) links: the journey to Ticino through the Gotthard Road Tunnel takes only 20 minutes and you can reach Milan by car in just 2 hours. Uri also has excellent public transport links heading north, the ‘Tell’ bus to Lucerne for example or the ‘Winkelried’ bus to Stans, which are set to become even better with the opening of the new Altdorf cantonal train station. 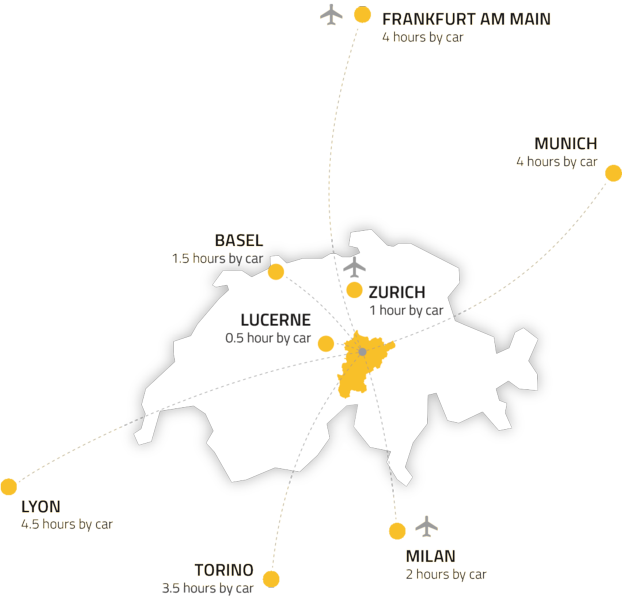 Travelling by car or lorry, you can be in Zurich in just one hour and Lucerne in 35 minutes. There are also considerable and ongoing investments in optimising public and private transport links within the canton itself. You can experience the famous spirit of freedom associated with Uri as you travel around the canton. Social stability, liberal labour laws and low unemployment rates are hallmarks of the Swiss economy. Thanks to its longer working hours, shorter holidays and moderate social security contributions, Switzerland is also a very productive country. This is reflected in the fact that, in 2015/2016, Switzerland was again found to be the most competitive country in the world. A key factor in the country’s success, however, is the high standard of education in general and its excellent vocational education system. Uri itself is renowned for its motivated, hard-working and loyal employees – and employees are the backbone of any business. Travel within Uri itself is very quick, and commuters from Zug, Zurich or Lucerne travel against the flow so unlikely to encounter traffic jams, to the benefit of work, leisure, and family life. Uri boasts a highly skilled, quality conscious workforce. You will find specialists in metalworking and mechanical engineering, plastics and rubber as well as a number of service industries and the creative and IT professions. Perhaps due to its small size, Uri has long been synonymous with innovation and thinking outside the box. For instance, Uri industrial expertise is responsible for the rubber gaskets used in the Burj Al Arab hotel in Dubai, for the special coating used in the launcher body of the Ariane 5 rocket and for the world-famous Nespresso coffee capsules. And did you know that sealing components from a Uri company are installed in around half of all cars worldwide? Precision work and top performance require well-rested, highly focused team workers – so it’s good to know that in Uri, you don’t need to go far to recharge your batteries. Source: Based on figures from BFS (Swiss Federal Statistical Office). Life is good in Uri! With the lake and mountains on your doorstep, it’s easy to relax and unwind or follow sportier pursuits. It is only 30 minutes by car from Altdorf to the popular Andermatt ski resort, for example. Or if golf is more your bag, there are a great variety of golf courses available in the nearby towns of Seedorf, Andermatt, Realp and Morschach. The Reuss Valley also offers a thriving social scene with a diverse range of cultural and leisure activities. Nature lovers will delight in the breathtaking scenery and peaceful surroundings of the tributary valleys with their sleepy hamlets. In Uri, children can safely make their own way to school, and school-leavers have a variety of apprenticeships and higher educational opportunities to look forward to. Uri has everything you could possibly wish for. And should you ever fancy something different, a complete change of scenery is only a short hop away.